Thanks for the thorough explanation. Claiming someone elses ancestors makes no sense when she should be proud of her own ancestors. We all secretly hope to find connections to historical figures but it doesn’t mean we fabricate a genealogical web of lies to connect ourselves to unrelated people. I would like to give her the benefit of the doubt that she’s confusing the two Keziah’s but her blatant disregard for the truth leads Mohr to believe otherwise. You’ve done all you can by laying out the facts and letting people know and we thank you for it. I have had contact with Tria Robinson she claimed she was Yemassee, Midwest Saponi, Haliwa-Saponi, Tuscaroa, and Lumbee. When I asked her about this she got very rude and blocked me. Thank you for sharing that and I’m sorry to hear about her interaction with you. It seems she blocks anyone who dares to inquire about her claims. I think that says a lot. She told me that she is Tuscarora and Lumbee. She also told me the Pura Fe is her cousin. Jeez, I thought it was bad when an actual cousin took credit for a hypothesis I developed and has now been proven by DNA as HER own work! You did absolutely the right thing in exposing this fraud. I’m so sorry all of you are having this experience. Thank you Yvonne! In the short time since I posted this blog, I’ve had additional people contact me about her. I will likely add an addendum to this blog post. We have had the same thing happen to our family tree on Ancestry. They took info as well as photos and posted them in their tree as their ancestor and made themselves related to my family. So I know how you feel and I wish we did what you are doing. Good for you ! I feel for you Kianga. I have had folks who I spent literally hours with, showing them how the Jeffries (and other) family works out, and the documentation there of, who became literally abusive with me when I showed them how they were confused. They then continued to claim descent from the family even after being showed beyond any shadow of a doubt that they had made an error. My attitude was “Well, originally they were ignorant, now they’re just stupid….” I’m getting too old to argue with people who want to indulge in fantasies and wishful thinking, so as long as they don’t bother me or use my name I let them believe whatever fairy tale they want. I understand why you had to respond, and I hope she will see the error of her ways and leave you alone. I would like to thank you for explaining this whole thing. 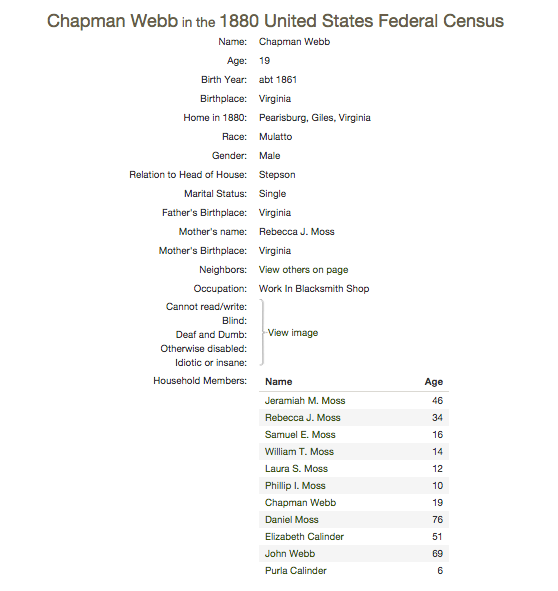 I am currently researching my own family history and am the actual 3rd great grand daughter of Daniel Moss and Keziah Shavers/Chavis Moss of Campbell, Giles County, VA. I can’t imagine how upsetting this must be. I apologize. Thank you again for exposing this chick. Being new to the group, I want to thank you for exposing this woman. Absolutely wonderful job of research , time lining and explanation. We all err at times, correct immediately— never, ever lie deliberately–even one falsehood would put all research in question/doubt. Having worked on/for Federal/State recognition for several; tribes, done or assisted in putting families back together as they happened, not as someone wanted them to be—-Creator knows, we have enough wannabee/fakes out there—siiiiiiiiiiiiiiigh. Thank you for sharing your time and expertise, work so openly.